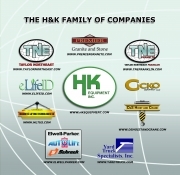 H&K Equipment is a provider of a broad range of services for Material Handling and Industrial Cleaning Equipment. Our services range from new and used truck sales, leasing and rentals to service, parts and remanufacturing. H&K Equipment has been an integral part of the lift truck market in the Pittsburgh area since 1935. We have built our company on an exceptional knowledge of large capacity trucks and the ability to fit their capabilities to any application. Email me jobs from H&K Equipment, Inc.